Across the Western Cape and Gauteng. Multiple fireplaces and decor in ode to film classic Casablanca, Rick's Café is made up of dynamic seating areas, for both big groups or a table of two, either way your cosiness is guaranteed. Upstairs there's also a spacious deck with heaters and a lounge area in the loft. 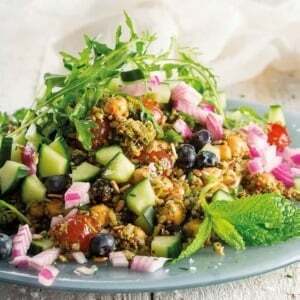 Rick's serves Middle Eastern inspired food, as well as tapas, burgers and grill options. La Mouette's historical setting with a plush detailed interior, lends itself to cosy, romantic evenings. The Two-story, old Tudor house feels like it was built for Wintery nights spent next to the fire place. It's the perfect place for a special occasion, or a date night, with outstanding food that never disappoints. An old faithful for many City Bowl locals, Societi Bistro exudes warmth the moment you walk in, and that's not just the fire. The overall ambience is always welcoming and down-to-earth. 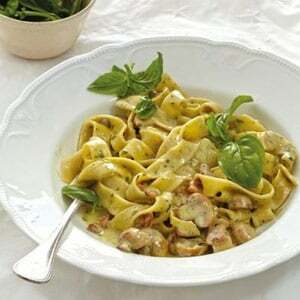 Societi's classic Italian cuisine combines with local flavours and flair. They also offer a private dining room, appropriately named The Snug, which you can book for private dinners. Foremely known as The Annex, this heritage restaurant has recently been revamped revealing a modern space that combines a bar, café and scenic outdoor restaurant. Inside the dining room's historical charm will warm you up in no time as you warm up by the fireplace and get stuck into the delicious slow cooked barbecue dishes or fresh seafood. A pub so fondly cherished by Cape Town and particularly by UCT students, Forrester's Arms as we know it today, was rebuilt in in the early 50s, in a style that looks like it belongs in the Austrian alps. While you warm up inside and indulge in the traditional pub grub, you might forget that it's not actually snowing outside. A long-standing British-style pub, only makes sense with a fireplace and a steady stream of visitors. Verdi has both and has 20 years under its belt to make the whole experience that much more authentic and charming. They are known for their wood-fired pizzas, and wonderfully friendly atmosphere, kind of like the Cheers of Wynberg. This iconic seafront restaurant isn't only suitable for Summer. Inside the decor boasts old school, sophisticated, fine dining, and an interior drenched in warm hues of red and chestnut brown wood. Sidle up near the fire and enjoy the ever popular seafood dishes. The Toad is loved for both its inside ambience and its outside setting that shows off sweeping views of the valley. This is a local spot and there's a reason why it's so close to the neighbourhood's heart: the food is consistently tasty and the vibe is always welcoming. Enjoy the warmth of the fire on chilly nights, which is amplified by the warmth of The Toad itself. Rhodes Memorial holds much sentimentality for Capetonians, being a place where many families and friends have gathered for special occasions. The classic and heritage café fare contribute to a feeling of nostalgia, particularly the toasties and milkshakes. Don't forget about this spot in the Winter, when the surrounding mountains fill up with mist and the thatch-housed restaurant has a plume of smoke exiting the chimney. Azure takes luxury to new heights with a dining room that is glamourous from head to toe. The roaring fire and view of the Atlantic creates a one of a kind experience of total indulgence and excellent food. Chef Christo Pretorius, creates dishes to match the elegant surroundings and dazzle the senses. This is a down-to-earth local favourite both for the bar and the food. 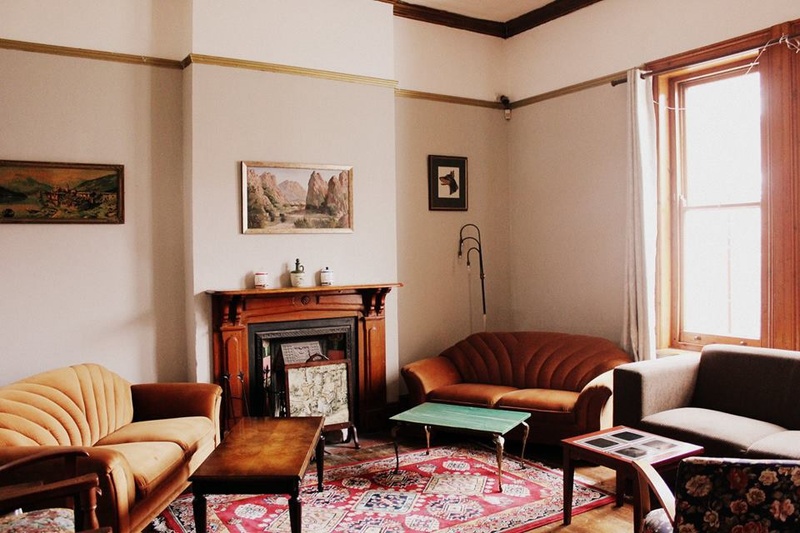 A Touch of Madness sits in an old Victorian house, guaranteeing effortless charm and of course fireplaces. 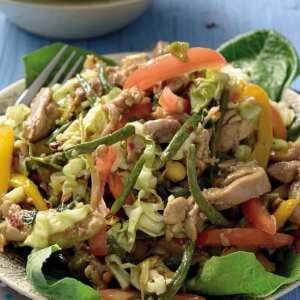 Food focuses on easy, laid-back meals like burgers, kebabs, meze and tacos. 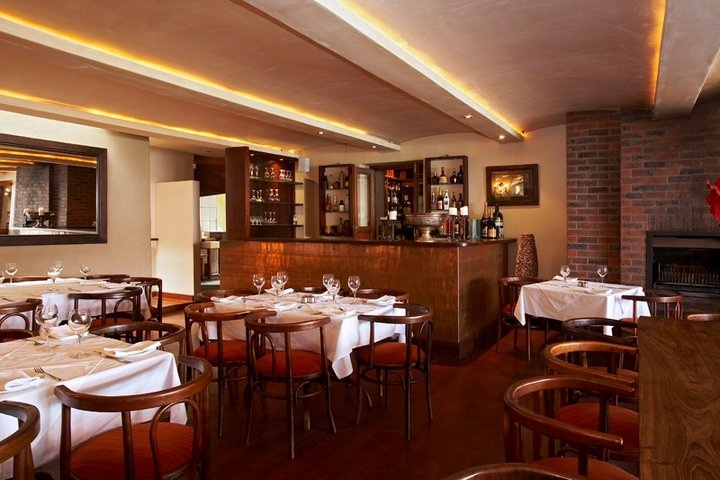 Blanko featured on our Winter specials guide for their two and three course special priced at R220 and R260. The chic, contemporary space is adorned in white and cream hues, with a rich oak wooden floor and an impressive collection of local art cluttering the walls for your viewing pleasure. Book a table by the fireplace to make sure your Wintery dinner is complete. 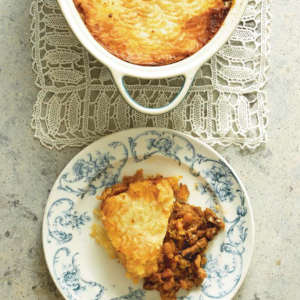 Over a decade old, Pastis has become an institution in the Constantia Winelands, and famous for their traditional French cuisine, and quintessential French setting. The fireplace is a central feature to their art nouveau interior, and that coupled with their hearty food makes this spot the ideal Winter setting. A contemporary Cape Dutch setting, that thrives on simplistic elegance, creating a setting that is both posh and relaxed. In Winter the sprawling vineyards and misty Steenberg mountains are a site to behold. Catharina's is currently holding a three course dinner special for R295 including wine. Groot Constantia, is just as pretty in Winter as it is in Summer. The old Cape Dutch house lends itself to a cosy lunch or dinner, and the roaring fire will have you feeling right at home. The Winter menu is made up of scrumptious country fare and dishes inspired by the heritage of Cape Malay culinary traditions. Open Door is a real gem in the Constantia Winelands, with its contemporary edge combined with raw industrial finishes and refined, plush accents, the space is simply beautiful with equally exquisite food. In Winter you can enjoy the warmth of the fire over breakfast, lunch and dinner, or even a cocktail at the bar. 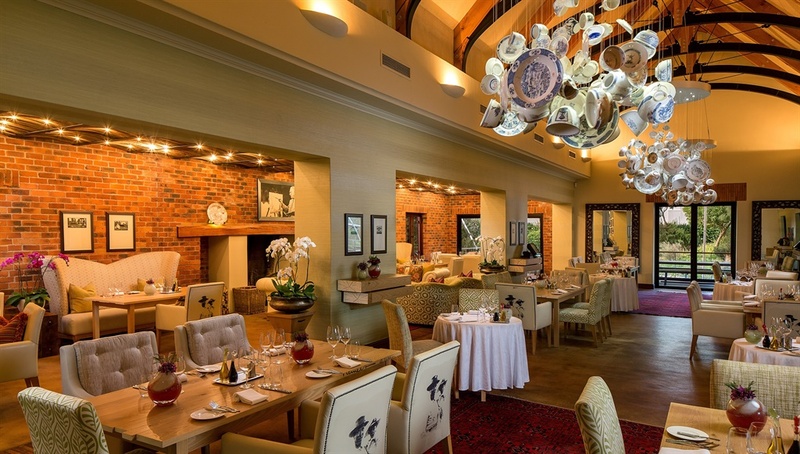 Pierneef is a fairly large restaurant, with an appropriately large fireplace that adds to the luxurious country charm of La Motte's fine dining restaurant. The food is always exceptional and takes inspiration from Franschoek's culinary heritage to execute dishes in a modern, inventive way. 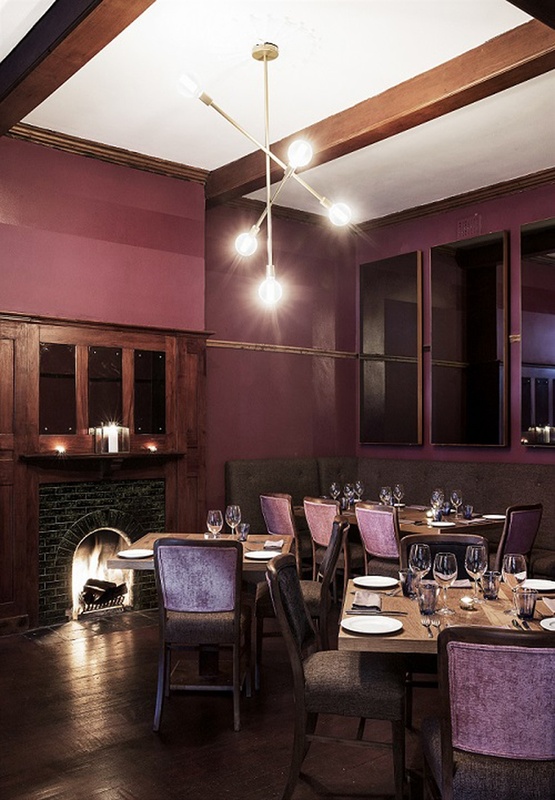 This restaurant is the definition of comfort and cosy, with three dining rooms, each with a fireplace of its own. 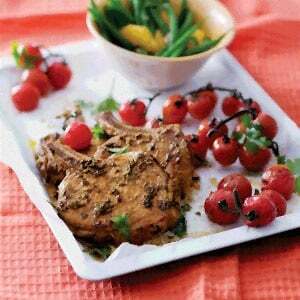 The food integrates a mix of French and local cuisine with a great selection of prime cut steaks and specialties like roasted pork fillet, duck breast and pan roasted salmon trout. Read our review here. Makaron has a new small plates menu that allows diners to sample a multitude of flavours this Winter. The striking gas fireplace is a central feature of the elegant dining room, which opens from breakfast to dinner. After dinner, head on over to the M Lounge, which is part study, part bar that serves designer cocktails as you sink into a sofa by the fire. Read about the new menu here. 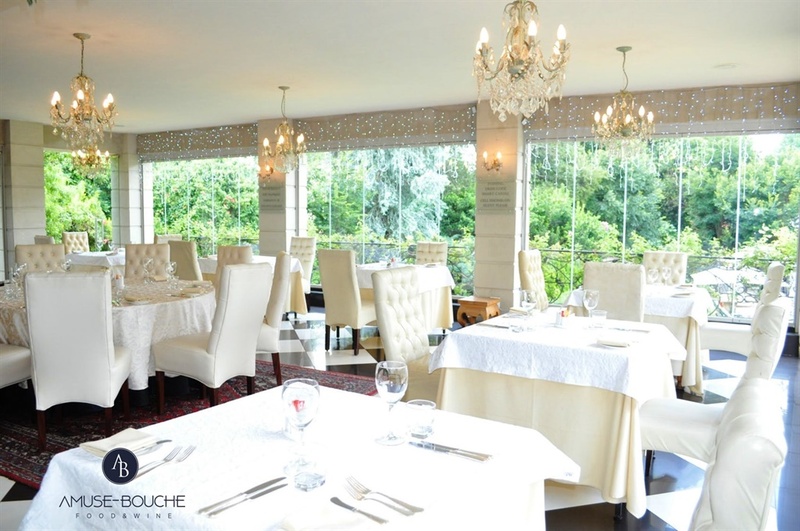 Haute Cabriere offers diners an experience right in the old cellar, which fits snugly into the Franschhoek mountains. 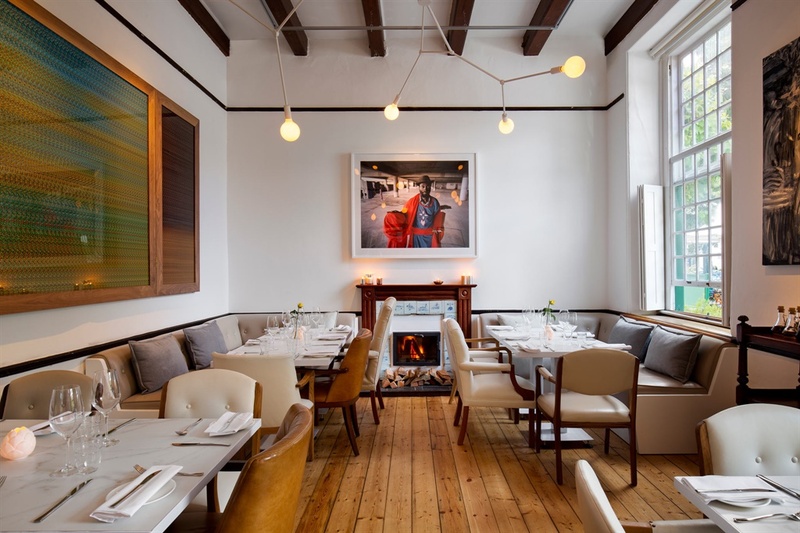 In Winter the huge fireplace spreads its warmth around the cavernous dining room, while diners enjoy a the culinary delights of Chefs Nic van Wyk and Westley Muller. Look out for their pop-up dinners and traditional Sunday lunches running throughout Winter. Bertus Basson's esteemed Winelands restaurant is made all the better over Winter with its huge fireplace, especially if you book the table right near it. Bertus's food is undeniably brilliant, with a changing menu that always pushes for creativity and excitement through flavour combinations unique preparations. Stanley Beer Yard is something extraordinary. The space combines rustic, industrial elements with an interesting choice of outlandish ornaments. 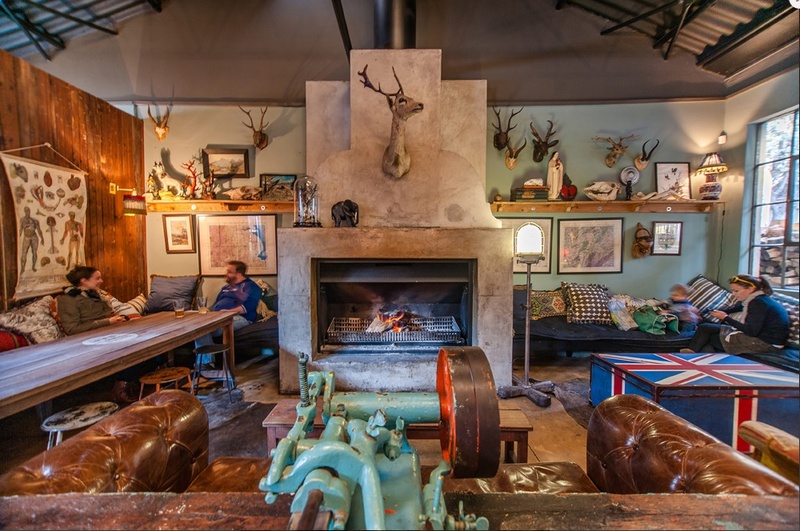 Think buck horns, peering out almost everywhere, antique lamps, paintings and sculptures accompanied by exposed wood tables, a corrugated metal roof, comfy couches and a massive fire place which brings the eclectic feel together perfectly. In terms of eats, expect a modern take on classic pub grub and light snacks to accompany their local craft beers and wine. The setting of the Churchhills bar seeks to recreate that of an upmarket British pub. The place dimly lit and a features a fire place that serves as a centre piece. Various parts of the restaurant offers cosy leather couch seats adorned with British themed scatter cushions. Casalinga’s is an Italian institution in Johannesburg, which prides itself in offering a sophisticated, simple, intimate dining experience. They make use of only the freshest seasonal produce, all their ingredients are natural and vegetables and herbs are grown in their garden. Their main dining area sports log fires that promises to keep you warm when dining in the Winter months and it contributes to the overall country setting. The Feedroom restaurant comes to life at the Tintswalo luxury boutique hotel and is set on the Waterfall Equestrian Estate. The venue is furnished with large windows that offers views of the lush, natural beauty of the greenery surrounding the dam just outside. Book a table by the fire place and enjoy something off their set menu that changes every now and then. Flames at the Joburg Four Seasons Hotel offers what they call an “urban-casual menu” featuring fresh, locally sourced, seasonal ingredients. The restaurant is minimally decorated featuring pearly white walls and plush couch-like chairs. In Winter you can cosy up by the fire while enjoying your meal and watch the activity on show in the open kitchen. Amuse Bouche Food and Wine at The Fairlawns Hotel offers diners an intimately romantic, candle-lit, Italian-influenced setting with a warm fire crackling in the background. They serve breakfast, lunch and dinner - featuring a la carte menus and options ranging from pasta to beef fillet, salads, scallops and much more. My Bread and Butter is a cute, family-run corner café in Joburg’s Parkview suburb. The setting is fairly simple with exposed stone walls and a dome ceiling that creates the illusion of the place being more spacious than it really is. They are open for breakfast and lunch where you can enjoy one of the classics like eggs Benedict or something along the lines of smoked salmon pasta, lamb curry and a slice of lemon meringue for dessert.